Central Library facade and plaza. Photo by Gregg Richards. Central Library's Grand Lobby. Photo by Gregg Richards. A book sale being held on the Central Library Plaza. Photo by Gregg Richards. Central Library's Brooklyn Gaze. Photo by Gregg Richards. A historic photograph of Central Library. Source: Brooklyn Collection. 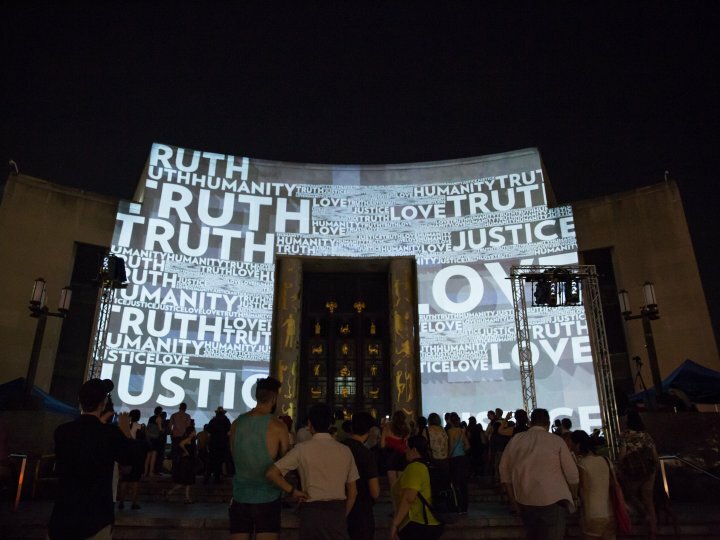 We are thrilled to welcome Emma's Torch to Brooklyn Public Library as its new cafe vendor! The mission of Emma's Torch is to harness the power of the culinary industry to help refugees build new lives in their new communities. Visit here for cafe hours and menu. If you’ve visited us lately, you may have noticed there is a lot of noise coming from the back-end of the building, and that tarps and protection have gone up over some windows on the parking lot side of the Flatbush Wing. It’s part of the first phase of Central Library’s renovation, which began in January 2019 and is projected to be completed by early 2021. Learn more about the project here. To get regular updates as to the progress of construction, follow our Central Library Renovations blog. 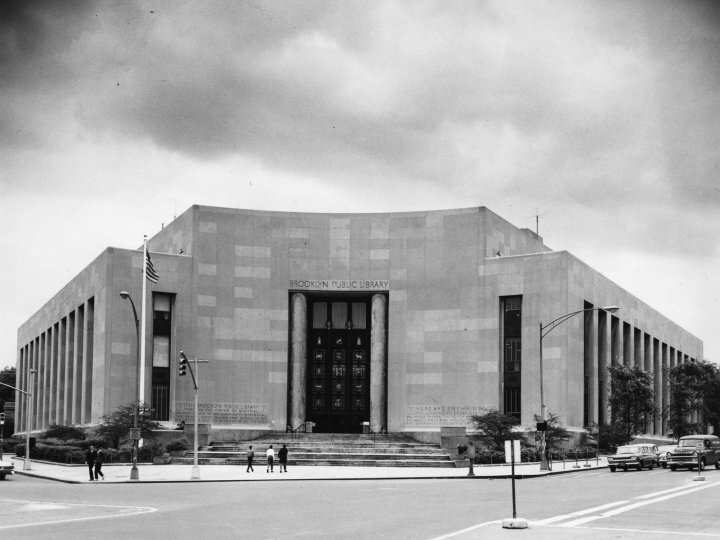 Central Library first opened its doors to the public on February 1, 1941. 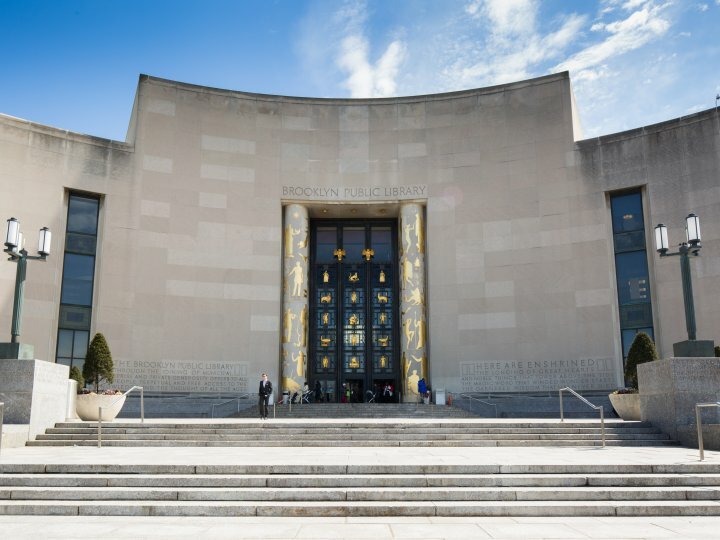 With its breathtaking façade, sweeping grand lobby and vast contemporary and historical collections, it has been a Brooklyn icon since its opening. The library was designated a New York City Landmark in 1997 and joined the National Register of Historic Places in 2002. 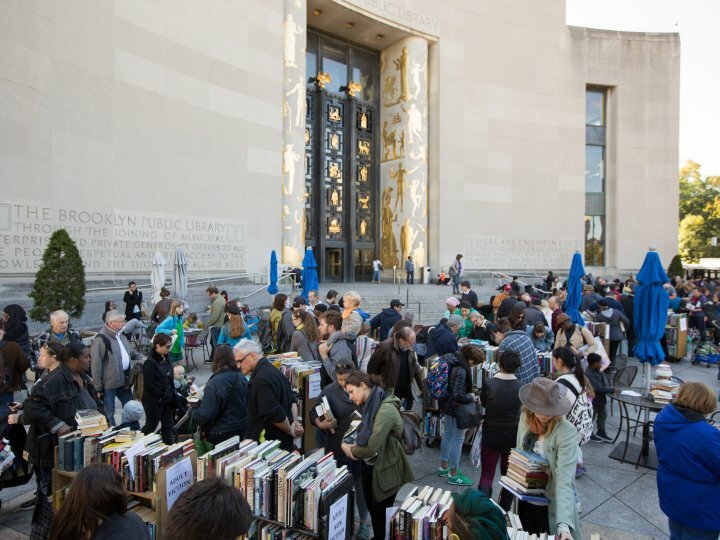 Central Library is Brooklyn’s home library, and one of New York City’s foremost cultural, civic and educational institutions. It is home to the Brooklyn Collection, the world’s largest public archive for the study of Brooklyn’s social and cultural history; the Dr. S. Stevan Dweck Cultural Center, home to our premiere programming series BPL Presents; the Shelby White & Leon Levy Information Commons, an innovative public coworking and meeting space offering the latest technology; and a Business and Career Center, offering books, resources and assistance on job search, small business entrepreneurship and personal finance. Three floors of collections span a multitude of subjects, and include rare reference resources as well as books and materials in more than 30 languages. Central Library receives more than 1.2 million visits each year, and items from its collections circulate 1.6 million times. For a limited pilot period, you can donate new and gently-used books at Central Library. Books can be delivered to the returns desk in the Central Library Grand Lobby any time during its hours of service. Designed to resemble an open book, Central Library is clad in limestone with impressive Art Deco detailing by sculptors Thomas Hudson Jones and Carl P. Jennewein. Perhaps the building’s most striking feature is its 50-foot-high entry portico, set into a concave façade that reflects the elliptical configuration of Grand Army Plaza. The dramatic entrance is adorned by fifteen bronze sculptures of famous characters and authors from American literature, framed by columns with a series of gilded bas-reliefs depicting the evolution of art and science. View a slideshow of historical Central Library photographs. 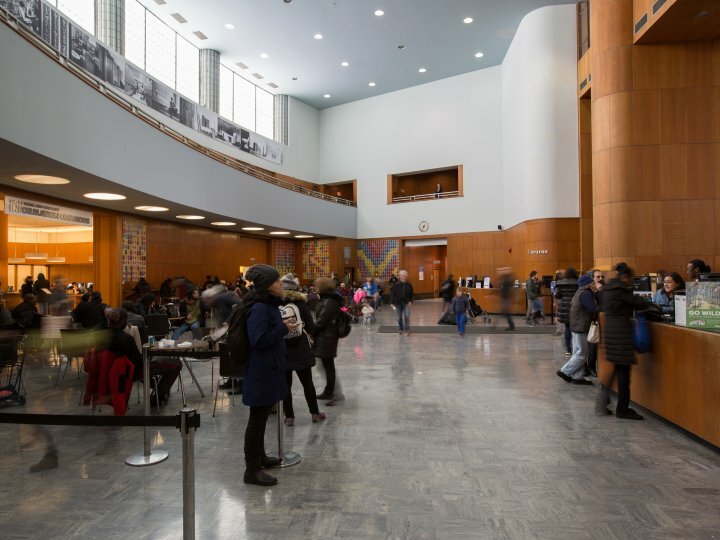 Brooklyn Public Library is a selective Federal Depository for government publications. Central Library is fully wheelchair accessible. View the library floor plan (PDF). On Tuesday, May 7, Central Library will close at 5pm for Michael Ondaantje discusses Warlight. For dates, times, and registration information for these events please visit this page. Follow Central Library on Facebook!